The seals of the Abyss are sundered and demons walk the earth again, claiming souls as they vie for dominance across the globe. Hidden within their ancient sanctums, the Earthbound stir after millennia of sleep, summoning their scattered worshippers and forging chains of slavery for fallen and mortal alike. Now come the words of Lucifer himself, lost Prince of the Fallen, warning of the terrible cataclysm to come. Once they ruled the earth as gods, radiant spirits of fire and thunder that defied the fury of Heaven for a thousand years. Now the angels of the Abyss have returned to a world that has forgotten them, a place devoid of the faith that fueled their dreams of glory. No longer titans of creation but bound in frail vessels of human flesh, the fallen are but shadows of their former might, tormented by the pain of their long imprisonment. They have faced the fury of the Allmightly, borne defeat and eternal damnation. This time nothing will stand in their way. The seals of Armageddon are sundered, and the damned have shaken off their chains. While the lords of the Abyss marshal their forces and rekindle ancient ambitions, they are unaware that darker forces wait in remote parts of the world. The Earthbound have slumbered for centuries, waiting for their opportunity to enslave mankind, and the demons are the key. Caught up in the intrigues of a forgotten age, will the legions of the Abyss re-ignite the fires of rebellion or consume the Earth in flames? 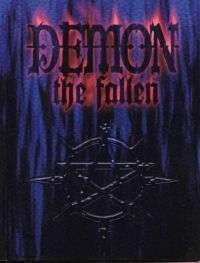 Gaviel, a smooth-talking demon who made his way out of hell, finds himself playing the part of Noah Wallace, son and heir apparent to a televangelist mission with bulging coffers. A perfect cover for a devil on the make! Not everything can go according to plan, however. The mad demon Avitu is looking to recruit Gaviel, while the avenging angel Usiel just wants to send him back to Hell. And all the while, the spirit of Noah Wallace is clamoring for its body back, and getting just a little stronger every day. Sabriel, seductive fallen anges that she is, has been playing games with the souls of mortals and devils alike. The demons Hasmed and Usiel have both felt the sting of her tender mercies, but now they might be her only hope of staving off an apocalypse. The ancient creature called Avitu has decided that humanity, demons and all the universe want nothing more than oblivion, and it is getting ready to provide it. Can Sabriel prove it wrong?